East Africa faces a massive humanitarian crisis. It threatens the lives and livelihoods of millions of people. 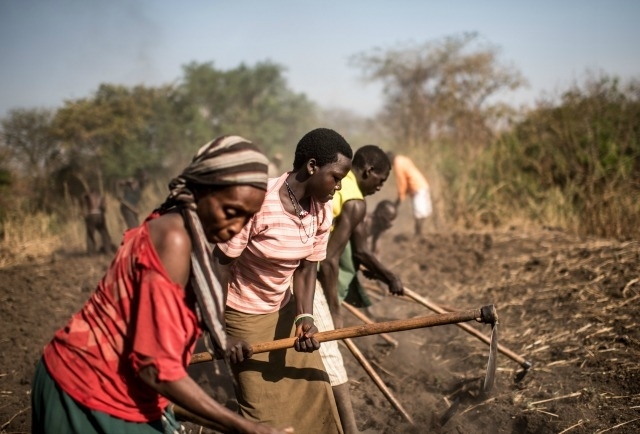 Severe drought and violent conflict fuel food insecurity. Caritas is striving to respond to enormous challenges across the region. 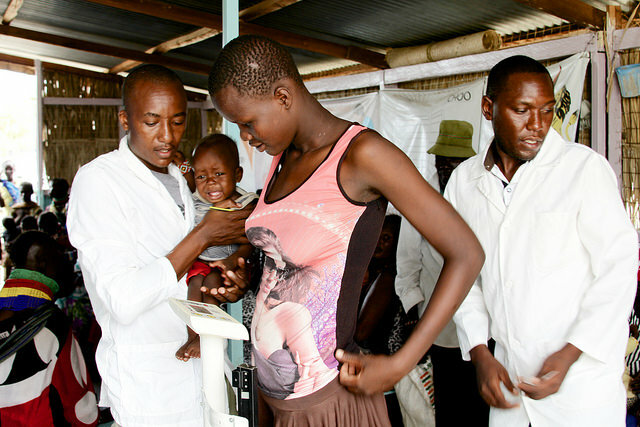 St. Mary’s Primary Healthcare Centre in the town of Kalokol in Kenya. The centre is supported by Caritas organisation Trócaire and is being used as an emergency clinic for young children suffering the effects of malnutrition. Photo: David O’Hare/Trócaire. Somalia, Ethiopia, Kenya, Uganda and South Sudan are suffering from severe drought. 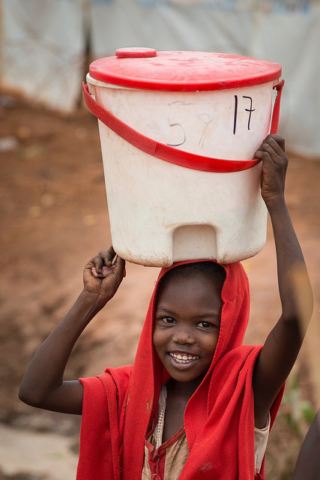 Areas such as central and southern Somalia have registered only a third of their usual seasonal rainfall. Conflict is forcing people from their homes and restricts humanitarian access. The insecurity prevents food production and drives prices higher. Caritas currently funds 140 aid projects, providing assistance for more than 4.3 million people in need. Around two thirds of Caritas programmes focus on food security and livelihoods. “At this time it’s more necessary than ever for everyone to not just stop with words, but to take concrete action so that food aid can reach suffering populations,” said Pope Francis. The first famine in the world for 6 years was officially declared by the UN in South Sudan in February. It threatens to be worse than a previous famine in 2011 in Somalia. Around 5.5 million people in South Sudan face severe hunger and 7.5 million are in need of humanitarian aid and protection. The numbers of those in need has increased dramatically in the past few months as the result of extreme drought after two rainy seasons in 2016 (March-May and Oct-Dec) that produced very low levels of rainfall. This has caused widespread crop failure, acute water shortages and a sharp fall in agriculture and livestock productivity which have had a devastating impact on food security and nutrition. There are also increasing reports of disease outbreaks and conflict as a result of displacement and water shortages. An estimated 100,000 people are facing famine and 4.9 million people are currently food insecure across South Sudan – an increase of 1.5 million since the beginning of 2016. Children are not getting enough to eat and more than 250,000 are expected to be affected by severe malnutrition this year. Food insecurity is expected to worsen at the peak of the lean season, between May and August. Unity, Central Equatoria, Western and Northern Bahr el Ghazal, Jonglei and Upper Nile are of most concern and the famine is expected to further spread in Unity. Food security is expected to improve only slightly in September with the harvest. There are many challenges. According to the latest figure, it is 12 times more costly to implement projects in South Sudan than in Kenya because of the risks and logistical challenges. In South Sudan Caritas is financing 70 projects aimed at helping more than 480,000 beneficiaries. More than $US12 million or 42 percent of the funding provided by Caritas and its agencies in South Sudan is being spent on emergency assistance programmes. During the 2011 famine, 260,000 people died in Somalia. History looks set to repeat itself. Somalia has been struck by a severe drought due to two consecutive seasons of poor rainfall, and even more in some areas. In the worst affected areas, there is widespread crop failure and large numbers of livestock are dying. 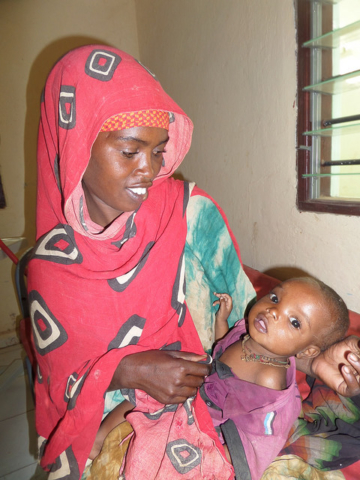 Malnutrition and drought-related diseases are on the rise in Somalia. Increasing competition for resources such as water is provoking local tensions and fears of further conflict. Over 6.2 million people or half the population are in need of humanitarian assistance (OCHA). The poor start to the April-June rains across the country means that the significant deterioration of food security levels is likely to continue at least until the start of 2018, when the short October-December rains may improve food security. There is concern that El Niño conditions could impact the October-December rainfall at the end of 2017 and further exacerbate food security conditions. Continuous damage to crops and livestock is likely to further diminish purchasing power of rural Somalis, heightening the possibility of famine in the country. “The situation of hunger is particularly serious in Somalia because the natural calamity combines with the human calamity: for 26 years there has been no functioning national state institutions,” said Bishop Giorgio Bertin, president of Caritas Somalia. The epicentre of the food crisis is around south-central Somalia and the capital Mogadishu, where thousands of people are seeking survival in makeshift camps with unsanitary conditions. Cholerea has broken out. Aid efforts must also reach rural populations, which make up 90 percent of those in need of urgent food assistance — and are much harder to reach. Caritas is funding 25 projects that will help nearly 600,000 people in Somalia. Food security, health and nutrition are urgent priorities as the country struggles to deal with the impact of the drought. Caritas is also treating Cholera patients through its health programming. Demand for aid has increased significantly in Ethiopia as the impact of the drought affects a growing number of people. The Government of Ethiopia and humanitarian partners issued a joint 2017 Humanitarian Requirements Document (HRD) in January 2017 requesting US$948 million for food and non-food assistance. A programme providing clean water in Ethioia supported by Caritas. Phoyo by Jon Björgvinsson/Glückskette for Caritas Switzerland. An estimated 5.6 million people require emergency food assistance this year, while some 2.7 million children and pregnant and lactating mothers with moderate acute malnutrition will require supplementary feeding. Around 9.2 million people will require WASH support and some 1.9 million households will need livestock support. But according to the latest information, Ethiopia’s humanitarian crisis is quickly changing and the gravity of the situation is worsening with an additional 2.2 million people in need of food assistance. Caritas is spending more than $US30 million on 17 aid projects aimed at helping more than 1.4 million people. Kenya declared a national disaster in February after a bleak rainfall assessment. The number of people in need of humanitarian assistance dramatically doubled from 1.3 million people in August 2016 to 2.6 million people in February 2017 due to the drought. Severely low levels of rainfall have resulted in widespread crop failure, acute water shortages, sharply declining terms of trade for pastoralists and declining animal productivity which have had a devastating impact of food security and nutrition conditions. People are exhausted and unable to cope with another shock. There are also increasing reports of disease outbreaks and conflict as a result of displacement and water shortages. 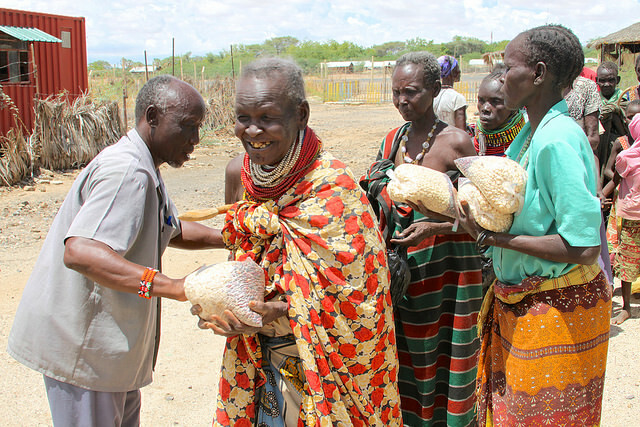 An emergency food distribution funded near the centre of Lodwar town in northern Kenya. Photo: David O’Hare/Trócaire. Needs are expected to peak in October before the short rains improve water and forage availability but there are an increasing number of poor households expected to face a dire situation. Caritas and its partners are currently funding 20 projects in Kenya aimed at reaching nearly 470,000 people. Assistance includes cash transfers, subsidies for water trucking and peace building, hygiene promotion, livestock feeding and vaccination, provision of seeds and agricultural training. More than 1 million South Sudanese have fled the civil war, 900,000 of them to seek safety in Uganda. It’s Africa’s biggest refugee crisis since the genocide in Rwanda in 1994. Uganda has one of the most generous refugee policies in the world, and the refugees have been welcomed with land to farm, supplies and shelter. Caritas works in Bidi Bidi, which overnight has become the largest refugee camp in the world . There staff supply tools and vegetable seeds and some families have already been harvesting leaves of cowpeas and okra to add to their diet. Families have adopted improved farming practises thanks to trainings. 100 youth are attending vocational training in carpentry and joinery have made attractive small tables for tea and displayed some at the nearby markets for sale. Meanwhile, Uganda is currently facing a severe food crisis. Eastern and North Eastern Uganda have been particularly affected. Food prices have been steadily rising over the last six months due to drought. In response to both the refugee and the food crisis, Caritas is helping 700,000 people with a $5.6 million budget. Why are there droughts in East Africa so often? In general, droughts are occurring in East Africa increasingly often. The region suffered from major droughts in 2011 and in 2009. Because droughts are happening with such frequency, people have very little time to rebuild their lives and livelihoods between each event. When there are rains, they are less predictable than in the past, making it harder for farmers to plan ahead. The 2011 drought was a result of La Niña phenomenon: lower than normal temperatures in the Pacific Ocean had serious effects on weather conditions around the world. In many areas of East Africa, the rains that usually fall from March to June were far less heavy than usual. In 2017, the hunger crisis has been caused by severe and extreme weather shifts, part of the El Niño effect which has caused drought. For countries like South Sudan and Somalia this has been exacerbated by conflict and economic collapse. and the death rate exceeds two people out of every 10,000 per day for the entire population.